I have been a big opponent of the vanity twitter use (aka harvesting followers, hoping that “followers” equals “audience”). In practice, this meant that from a point on, I completely stopped looking who is following me, did not reciprocate at the cost of being perceived as arrogant and kept my follower/following ratio to 4. Still not content, I unfollowed quite a number of twitterers (some of them pretty big names) on the grounds that they were either producing too much noise, or were talking about things I found irrelevant to me. In the beginning, it was conversations. But as people kept flocking around twitter, conversing became hard, if not impossible. Then it was news tracking which, although useful, it was far from complete. Yes, the news came to me, but not the news I was always interested. And with it came a lot of repetition and nonsense. 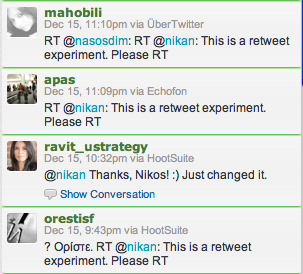 Then, based on retweets, it was content discovery and evaluation. Grouping people allowed to create filters: filters for news, for content, for community info. Finally, there came mindcasting. The most interesting use of twitter. The one I subscribe. The grouping feature offered by many twitter clients, has, for a long time, being the single organizing factor that brought some order into chaos. But, lately, we have another one, far too important: Lists! Although lists look pretty much as the groups of twitter clients, they are not the same: groups are for the people we follow or those that follow us, while lists are for everyone! This difference is a game changer. Already people use how often they are listed as a measure of importance, influence or popularity. But lists have another function: they are metadata. 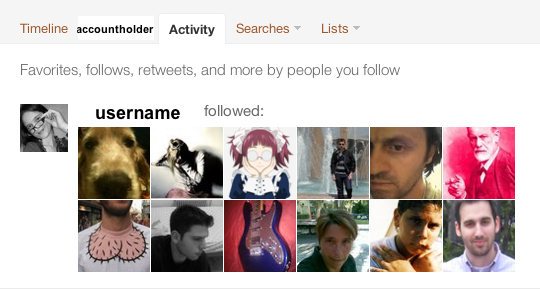 The criteria we use to classify twitterers in lists, describe what they are or how we view them. Also, lists, unlike groups, can be public, can be viewed and subscribed by others. And as such, they bring focus and attention from another angle. Lists can bring back the sanity in twitter. They can undermine the follower fallacy, they can bring value to ordinary users as well as to businesses and marketers. By allowing us to make a fundamental distinction: following is an action of trust and, to some extend, intimacy. Subscribing to a list is willingness to be informed. So if you are on twitter to spread your message (be it news or offers or corporate messages) seek to be listed, not followed. Your very intention implies that you most likely want to use twitter for broadcasting and not for creating relationships. That is fine. You won’t have to pretend you are a ‘friend’ from now on. You aren’t. You never were. But now message spreading can be done without undermining the everyday experience of ordinary users. I remember a time (not so long ago) when people were disgusted by partial feeds and most of the major blogs and bloggers abided by this unwritten law. Publishing a partial feed was synonymous to cheap exploitation, putting ad revenues over readership, alienating your readers etc. I, myself, am guilty of accusing blogs for this kind of ‘malpractice’. I see more and more probloggers publishing partial feed and very few readers complaining. Because the way we read and follow blogs has changed too. Information is coming to us. And usually it comes in the form of a short sentence with a link in it, something especially true for twitter. So the trend of reading everything in the coziness of our feed reader is in decline, while reading from the source is back with a vengeance. Twitter and Facebook are the benefactors of blog ad revenues. The recent update of twitter’s Terms of Service, brought to my attention this page from twitter support : The Twitter Rules. 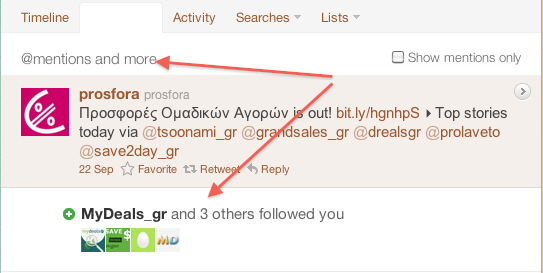 Is it not a long read but it is quite educative as to what twitter considers as spam or spamming behavior. Instead, the following 14 points list of spamming behaviors is cited. The one in bold has a special interest. If your updates contain mainly links you are considered a spammer! There’re thousands of accounts in twitter that do just this. How? By linking a blog feed to a twitter account. In such a case all twitter updates are links back to the blogposts. Leaving aside the fact that these might not be appealing accounts to follow, considering link-posting as a spamming behavior contradicts the presence of major media organizations in twitter and there are no signs that twitter actually objects their presence. But if link-posting is ok for, say, CNN why would that be bad for blog xyz with the 20 followers? The rule becomes a size discrimination. Another notable notion in this rule is that twitter seems to still attribute value to the personal updates. For me personal updates are irrelevant but that is not the issue. The issue is that one should have the right to write about the things he truly cares. If drinking coffee with his spouse is one of them, that’s fine. But if not, that should be fine too. Besides, in order to have personal updates you must have a person too. With all these business accounts, what sort of personal updates is to be expected? Maybe the reason why Twitter succeeds is because people don’t really want to have conversations. They just want to be able to scream out into the void and listen for echoes. If true, then all web 2.0 product developers should go back to the design desk. Web 2.0 is about conversations. The markets are conversations, says the Cluetrain Manifesto. New services want to be conversational. New marketing urges us to form relationships and interact through conversations. With so many claims on the term ‘conversation’, I am afraid the term is stretched to a point where it will either break or become meaningless. Defining is confining. If we accept that ‘conversation’ is a more serious kind of discussion (as opposed to chat), we can hardly apply this notion to the conversations happening online. Most of them are simply chat. Next comes the shouting in the void, like the tweets ‘I woke up and I am drinking coffee’ which occassionaly turn into a chat again. In blogs, we often see large threads of hundreds of comments, which, excluding spam and trolls, can be deemed as real conversations but not as one conversation. They are mostly conversations between the blogger and the commenters and secondly between the commenters themselves. The pingback mechanism has enabled a more sophisticated kind of conversations: through blog posts. These can be extensive and spread to too many blogs, so they are difficult to follow. In Friendfeed, humongous threads are commonplace, especially if Robert Scoble is the initiator. Yet, I don’t know many that read such threads from start to end. So, what is the point of these threads, conversation wise (because I can think of many other points apart from conversation)? In real life, you can have a conversation with only a few people. You cannot have a conversation with a whole football stadium! Likewise, online conversations that can have an impact, and feel like they do, are the ones that people can participate from start to end, understand who else is participating, and catch up really quickly, if joining late. For this reason (and contrary to the popular perception) twitter and twitter-like tools, by restricting the length of the what is being said and by limiting the participants of the conversation, turn out to be more conversational (subject to abuse though). When people complain about twitter not being conversational, they may actually complain not been allowed to blah blah endlessly. But we agreed that this isn’t a conversation, didn’t we?